The first official trailer for Star Wars: The Last Jedi caused a major kerfuffle when it dropped earlier this week and one new addition to the Star Wars universe captured the hearts and minds of commentators. That was of course, the porgs, the loveable new species of fluffy, flappy-winged sea birds who are native to the planet Ahch-To, where Luke Skywalker (Mark Hamill) has been living. The porgs instantly became an internet sensation, inspiring countless memes and frequent "aww" sounds from viewers. A porg with Chewbacca - would you be able?! And now it has been revealed that the porgs were inspired by the puffins that live on Skellig Michael in Kerry, where the final scenes of The Forces Awakens were shot. Director Rian Johnson told Entertainment Weekly about creating the characters, saying: "If you go to Skellig at the right time of year, it’s just covered in puffins, and they’re the most adorable things in the world. "So when I was first scouting there, I saw these guys, and I was like, oh, these are part of the island. And so the porgs are in that realm." Dr Mark Jessop, marine biologist in UCC, appeared on The Ray D'Arcy Show on RTÉ Radio 1 to discuss the puffins, and he said they'd be hard to miss if you were on the island. "There’s quite a few thousand of them breeding on the Skelligs and that’s where they did a lot of the filming for Star Wars so it’s not really out of the universe that they’ve taken them as an inspiration for one of their new characters", he said. Take a look at some of the best porg-inspired banter on Twitter below. 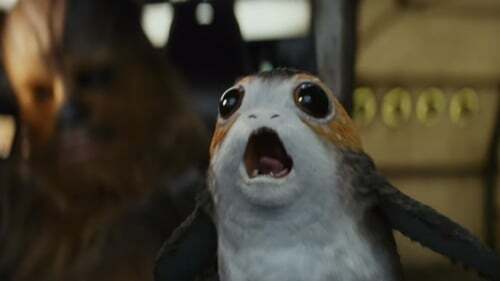 Porgs are the baby Groot of Star Wars. In case you missed it - here's the epic and ominous Star Wars: The Last Jedi trailer. Star Wars: The Last Jedi will be released in Irish cinemas on December 15.